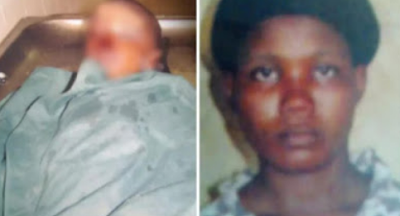 A 21-year-old woman, Rebecca Bassey, has been arrested by the Lagos State Police Command for allegedly beating her husband’s 3-year-old niece, Deborah Bassey, to death. According to police authorities, the suspect beat up the girl because she vomited and defecated on herself. The incident occurred at Ijaiye Ojokoro, Lagos. According to police investigations, on the day of the incident, Deborah woke up around 5.30am with a high temperature and was reported to have started vomiting and defecating soon after. This was said to have angered Rebecca, who instead of administering treatment to the child, decided to beat her up. However, in the process of beating the girl, the suspect pushed her and she fell, hitting her head against the edge of a wooden chair in the room. The impact of her hitting her head against the edge of the wooden chair caused her to start bleeding. Some neighbours rushed her to Ahmadiyya Hospital, where she was referred to Orile Agege General Hospital where she later died. It was learnt that the matter had been transferred to the State Criminal Investigation Department, Yaba, as they await the autopsy result. What a wicked world.